The 20” carry-on hardshell bag by Brookstone is a modern 2018 release model with the integrated dual charging USB ports. You can purchase it in one of the four colors of black, grey, cream or purple and all of them have the same price tag. Purple, cream or grey colors will make the bag easy to pick at the airport carousel if you need to check it in before your flight. The power bank is not included in the package and the USB ports will give you access to it. The exterior shell of this bag is the rather sturdy and durable ABS plastic that proves to be resistant to impact and rain as well. 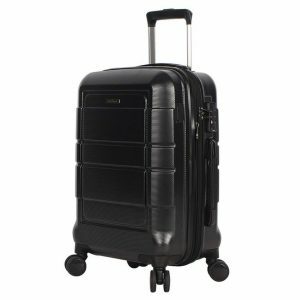 Brookstone Carry-on Bag comes with eight large multi-directional rolling spinner wheels that roll very smoothly and quietly on different grounds. You can increase the storage space in this bag by up to twenty percent through the zipper in the middle. 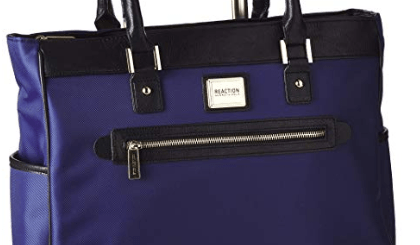 In the fully-lined polyester, supple fabric interior you have plenty of packing space, with the adjustable elastic cross straps on one side and two zipped and one unzipped pockets (a multi-pocket interior organizer) for your smaller items. It has a sturdy multi-tiered and retractable telescoping handle to help you navigate the bag easily. There are also top-mounted and side-mounted handles for when you wish to hold the cabin bag horizontally and vertically- to grab and go. The tough hardshell exterior is resistant to bad treatment by luggage handlers at the airport. And it keeps your belongings- clothes and other items safe. At the current price level it seems to offer quite a bit in terms of durability, functionality and design. It has an integrated combo lock that is TSA-approved, so only the TSA staff at the airport can get into the bag without needing to break the lock. The TSA lock gives this bag an additional security. 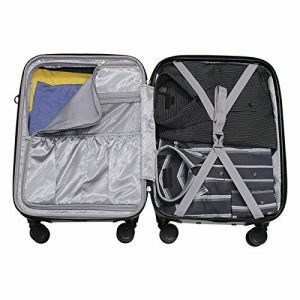 The Brookstone Cabin Bag (25336 26 20S) weighs 7 pounds and measures 13.5 x 8.5 x 19.5 inches. It is very nice looking no matter which color you pick, has an ergonomic and user-friendly design with a solid telescoping handle, total of eight solid spinner wheels, a sturdy hardshell exterior, multi-organizational pockets, two USB ports, good quality zippers, TSA-approved combo lock and up to 20% expandability at a very reasonable price. We do not hesitate to recommend this great bag to anyone looking for something very robust and functional on their holidays or business trips that are up to a week long.